A deodorant powder to keep you feeling dry and smelling fresh. 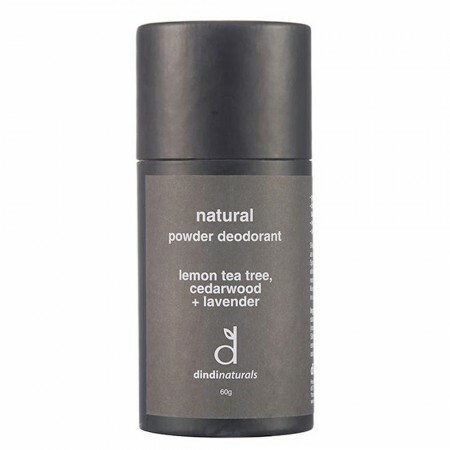 Arrowroot, tapioca and bentonite clay powders are combined with lemon tea tree, cedarwood and lavender essential oils, for a bi-carb free and vegan friendly natural deodorant. This gentle formula can also be used to deodorise feet, carpets and doggy beds. 60g. Lemon tea tree, cedarwood and lavender help combat bacteria and leave a fresh citrus scent with an earthy floral undertone. Keeps you dry throughout the day - reapply after heavy sweating. Contains aloe vera to soothe delicate skin. Active ingredients of arrowroot, tapioca, bentonite clay and non-nano zinc oxide to absorb wetness and neutralise odours. Shake out a small amount and apply directly to under arms or sprinkle on a puff apply. Best used on dry skin. Can also be used to deodorise smelly shoes, carpet or dog bedding. Arrowroot flour, tapioca starch, bentonite clay, zinc oxide (non-nano), powdered lemon peel, ginger root, Siberian ginseng and aloe vera, pure essential oils of lemon scented tea tree, cedarwood and lavender. Reusable and recyclable paper tube. Beauty product packaging can be recycled at any Biome location through Terracycle. Browse our other natural deodorants here.